Welcome to Question Corner with Teacher & Gordo. In these posts, you will learn useful information regarding CodeMonkey’s different content and courses. Each post will include questions from Teacher with answers from Gordo, Monkey’s smartest friend. Enjoy! Hi Teacher, guess what’s new! Users can now remix games built by others on CodeMonkey! That’s awesome, I know my students have wanted to remix games for a while now! Tell me, what exactly can students do with this new option? The remix feature allows students to take previously built games on CodeMonkey, duplicate them and modify the code to make their own versions of the original game. Since CodeMonkey is an educational platform, a great way to learn how to code is to look at what other students have written. 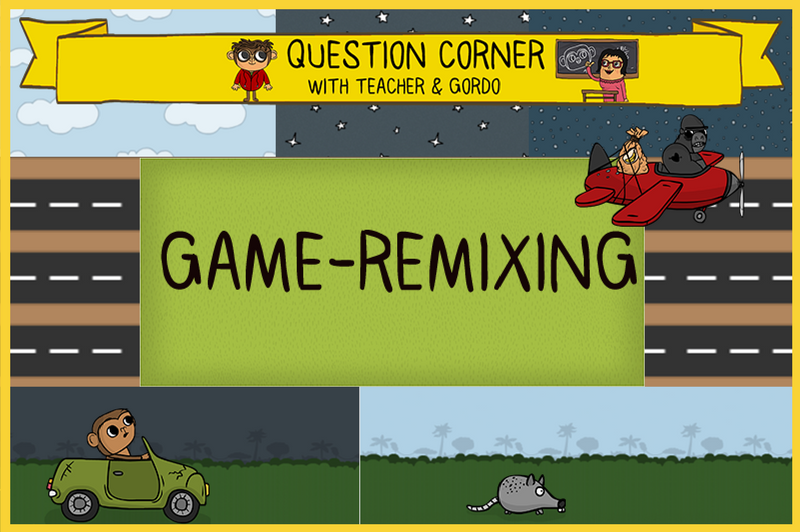 Game-remixing is a great way for students to see how others use GameBuilder and expand on their work. Awesome, how can I access it? First, go to any game on CodeMonkey, then click on the remix option and you will be given the editor version of the game that you chose. From there, you can begin ‘remixing’ the game by adding your own code and graphics to make your own version of the game. Cool, is there a course that teaches users how to create such a game? What ages is this made for? Just like GameBuilder, Game-Remixing is suitable for ages 12+. Thank you, I can’t wait to tell my students that they can now remix games! Great, be sure to share their games in the comments! Is there a way to block or limit access to the Discover – “Remix” games for students? Great question. You can control what your students publish (i.e. you can unpublish their games). If you have any more questions or concerns regarding Discover (or in general), please email us at info@cm-studios.com. We will be glad to help!